I was already progressing—at my last appointment (40 weeks) I was 5 cm dilated. Basically, I was afraid of having the baby fall out of me. I know many have done that successfully, but delivering on the side of the road or in the car was a slightly scary terrifying thought. Speaking of progressing…At 36 weeks I was 3cm dilated and everyone (doctors, midwives, random people in grocery stores, etc.) told me that they’d be shocked if I went to 41 weeks (how far along I was when I was induced with Julia). But once my due date came and went without a single Braxton Hicks contraction, I started doubting everyone and myself, and had a strong feeling that this baby would stay in forever. Then something happened! On my due date, I ended up losing my mucus plug and I had a twinge of excitement, thinking that maybe this was the start of something. I desperately wanted to go into labor naturally this time, but as the days lingered on without any more “signs,” my hope dwindled again. A few days after my due date I had an appointment with my midwife and we talked about an induction. 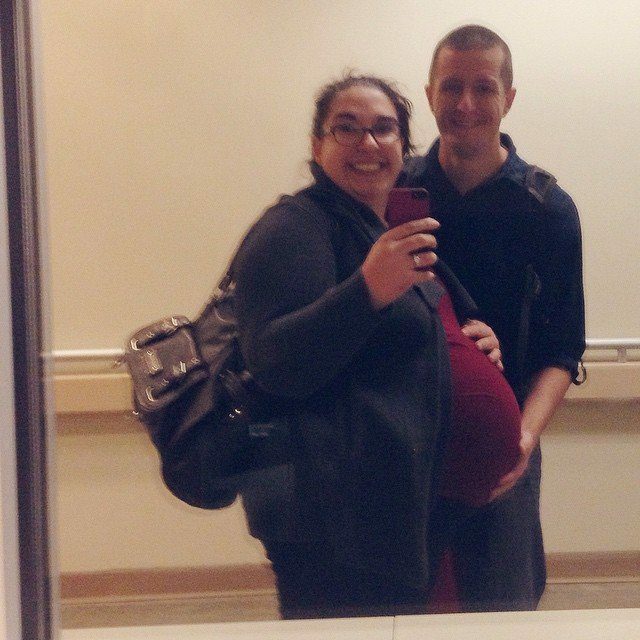 As much as I didn’t want to be induced, I was also at the end of my rope with being pregnant, so we scheduled one for 41 weeks and 3 days (the only day the hospital was available for an induction). I now had an eviction date for my baby. On Thursday afternoon/evening (at 40+5), I started feeling something a little different from the BH contractions; these felt a little more like menstrual cramps. I realized they were actually becoming somewhat consistent, so I found a free contraction timer app and quickly downloaded it. That night I had a craving for Chinese food, so we hopped in the car and went out to try a new restaurant. While we ate, the contractions continued and were around 15 minutes apart. After dinner, we got home, put Julia to bed, and I texted her babysitter with an update: letting her know that I had a feeling things would happen either that night or the next day, and that she should be on standby. Around 11 or so, with the contractions still coming every 6 to 20 minutes, we went to bed. My husband fell right asleep and I tried to sleep, but the cramping continued and they weren’t something I could just nap through. I kept timing them, and around 2 am they were around 6 to 13 minutes apart, and they were getting more intense. They started hurting so much that I couldn’t just relax in bed anymore; I had to stand up and walk around, and had to brace myself against my dresser whenever a contraction emerged. I debated for a long time (probably just a few minutes in retrospect) about whether or not I should wake up my husband and discuss going to the hospital. I felt silly that I didn’t know if this was really it or not. A few contractions later, I knew it’d be better to be safe than sorry, so I woke him up. My last “bump” picture. A reflection of us taken on our way into the hospital, in between contractions. I gave him a quick update and he suggested call my midwife’s office. I still felt silly; I didn’t want to make a huge production only to be sent home. Honestly, I wasn’t even sure if I was in labor—the “contractions” felt just like cramps, and I really thought I was supposed to feel it in my back and/or up higher on my belly. But these were really starting to hurt, and I had a hard time talking through them, so I called. An answering service picked up, the woman took my info, and five minutes later my midwife called back. I immediately felt horrible, because I could tell she was asleep. Adrenaline, excitement, and fear washed over me like a wave the second I hung up the phone. This was it. It’s go time. My husband already started getting ready, and I fretted for far too long on what to wear to the hospital (went with my staple for the previous three months: flip-flops, yoga pants, the longest tank top I had—no bra, because why not—and a sweater). The hospital bag was already in the car, but we had a few last-minute things to pack, and we needed to get Bella situated since we didn’t know how long we’d be away. (She has a doggy door, so we just left it open, filled up her bowls with plenty of food and water, and just let her roam.) The last piece to our puzzle was getting Julia up and in the car. We left the house 15 minutes after I hung up with my midwife (not too shabby), and 15 minutes after that we were dropping Julia off at the sitter. I gave her a big hug and cried as I left my first-born. It was so surreal knowing she’d have a sister the next time I saw her. If you can read between the blur, that’s a Jason Mraz song. 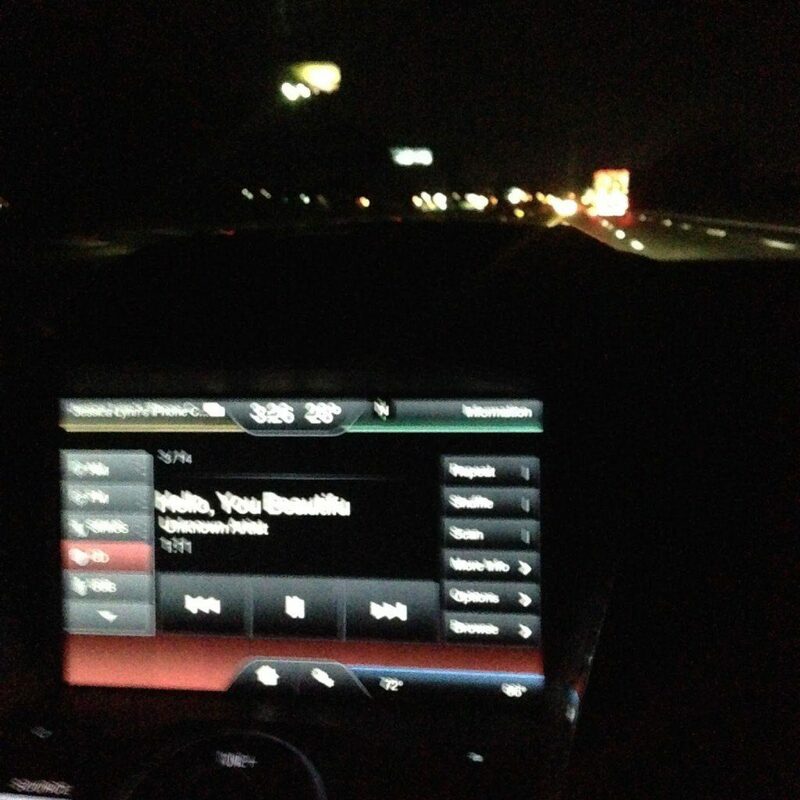 His latest album was soothing to listen to on the drive to the hospital. After all of my worry about when I’d go into labor, I was actually thankful we were on our way in the middle of the night since the roads were totally clear. My contractions were still coming around every 6 minutes, and I remember asking my husband to switch lanes, because it was way too bumpy and they were making my cramps even more intense. We got to the hospital and were slightly thrilled that we got a good parking space since we were there so early. At 3:30 am I checked in with triage and they started to asses me. I was 6 cm dilated and she told me I was definitely sticking around and having a baby soon. (AAHHH!!) I told the nurse admitting me that my contractions were so irregular that I wasn’t sure this was actually it. She said that with natural labor (as opposed to being induced like before), that contractions are irregular. That was totally news to me. The whole process of checking in took way longer than I expected, but an hour later I was finally situated in my room. They started me on antibiotics (I was positive for Group B Strep) at 4:30 am and hooked me up to the fetal monitors and all that jazz. Laying in bed was torture. Every contraction felt a thousand times worse, and all I wanted to do was walk around. The head nurse (a midwife in training) wasn’t very helpful and insisted I stay hooked up to everything for the time being. Finally, after an hour of being hooked up (around 5:30 am), I said I needed the bathroom, so they unhooked the fetal monitors (but left the straps on). My midwife Jeri appeared shortly after I finished my business. She asked how I was doing and I told her I really wanted to walk around. She took one look at me and asked why I was hooked up to everything and the kitchen sink. I told her about the nurse and she shook her head and started to—very quickly—unhooked everything, and then told me to go roam the halls. She checked me (and put me on the monitor for a few minutes to check the baby) around 6:45 am, and I was only at 7 cm. I felt somewhat defeated at that point since all the waddling I just did didn’t do a whole lot. She said I had some options: I could wait it out and see if more walking helps, or she could break my water now and get this show on the road. She mentioned that things could get pretty intense really quickly after my water broke. I asked if that meant I’d hurt more and she said yes. Not ready to deal with more pain quite yet, I asked if we could hold off on breaking my water for an hour or so and see if I could make more progress. She was fine with that, so the monitors came off and I started walking again.I mentioned over and over during the course of active labor that I felt like this wasn’t really it. I felt pretty great in between contractions. I was laughing, talking, smiling, and waddling like it was just a normal day; it was nothing like I saw in videos or stories I’ve read. I truly felt like I wasn’t in labor…until a contraction came along. The contractions were so intense that I’d have to brace myself along the wall and sway or rock back and forth while breathing rhythmically to get through it. Once it was over I’d go back to whatever conversation I was having with my husband. I totally felt like a fraud, because with Julia (and Pitocin), I was in constant pain and could barely form a coherent thought in between each contraction. That was all about to change, because walking around this time was a little more of a struggle. I started stopping a lot more frequently and the contractions were lasting longer—a few times they were right on top of each other. At one point I made my husband put down his cup of coffee and asked him to start actively rub my back to help relieve some tension. The laughter and conversations were also becoming fewer and far between. I managed to walk around for about a half hour before I needed something new. I headed back to the room and sat on the rocking chair for a little while. It felt fantastic to sit and rock, but the pain from the contractions were multiplied by a million when I was sitting. After I managed to stand up from the chair is when transition started hitting. Oh, transition. This was the worst—the absolute worst part. I started second guessing myself. Everything just hurt SO much. The intensity was beyond anything I’ve ever experienced, and I was seriously doubting ability to do this. Interestingly enough, the thought of an epidural never crossed my mind. Honestly, I think it’s because I literally couldn’t think of anything other than the contraction I was experiencing at that exact moment.I thought I was handling the contractions well (or as well as I could) by breathing rhythmically through them, but I noticed that my hands started to tingle…and then my ears started tingling, too. The nurse standing next to me told me I needed to breathe slower, so with her help and my husband’s guidance, I slowed down my breathing through each contraction. When the tingling subsided, fear struck me. I started thinking that they’d need to put me on oxygen and that something else was wrong with me—the tingling really freaked me out. The tingling, along with the shooting pain and pressure started breaking me down, and I started crying and telling my husband that I couldn’t do this. The amazing person that he is, shot down any negativity out of my mouth and instead, he insisted that I could do it. Not only that, but he told me that I was doing it! He wasn’t just my rock through the entire labor, he was so much more than that. His confidence and ability to stay calm and encouraging is absolutely the reason I didn’t completely freak out and made it through the next few minutes. Around 7:30 am, after walking around for just 45 minutes, I mentioned that I was starting to feel some crazy intense pressure down there, and that I almost had an urge to push. The nurses and my husband somehow helped me up onto the bed as I struggled through each contraction (they wanted to check me and get some quick stats on the baby). I hated that bed with a fiery passion. The nurse checked and told me that I was at 9 cm and my water sack was bulging. Hours later (really it was probably like 3-10 minutes later), my midwife still wasn’t in my room and I was feeling even more pressure to push. I told the nurse that I needed my midwife NOW, and I heard the same thing again—that she would be on her way shortly. In my mind, all I remember hearing from earlier was that I needed that bag of water popped before I could push. I was laying on my side on the bed, and was in so much pain and needed to push so badly that I told everyone in the room that I was ready to push. 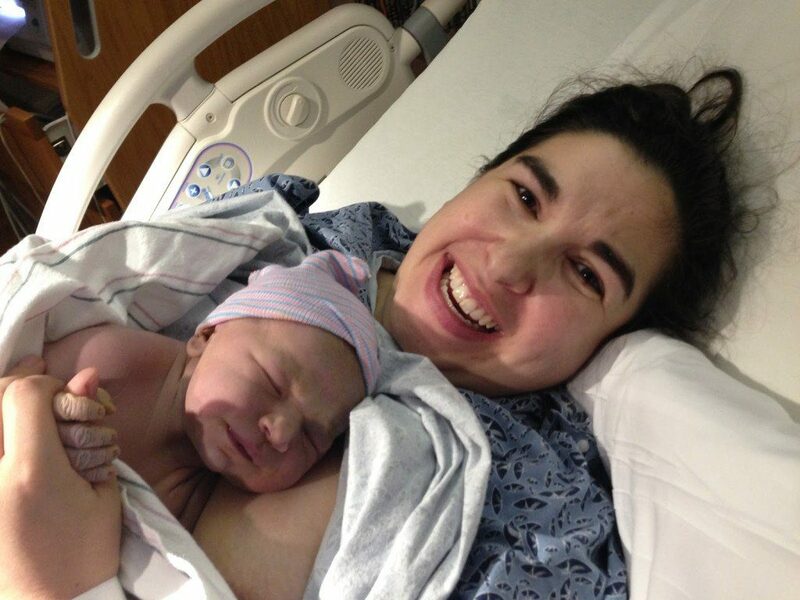 Screw the water and screw the midwife….this baby was coming and I needed to push—NOW. I don’t remember when she got there, but my other midwife, Laura, appeared out of nowhere, and seconds later, Jeri appeared. I told them they could pop my water now, because I was ready to push. They must’ve ignored me (which made me mad, because—hello—POP MY DAMN WATER ALREADY! ), because they both helped me roll over onto my back so I could push. With Jeri on my right, my husband on my left, and Laura at the foot of the bed, I felt the next contraction coming and pushed with all my might. I felt my baby move down and through me, and felt her head pass through. I felt a smidgen of relief once her head was out, but there was still pressure and the need to keep going—that’s when Jeri told me to keep pushing…so I did. In the same push I felt the rest of her body leave my body, and the pain and pressure immediately went away. At 7:56 am, Madilyn Rose was born and we became a family of four. Our very first photo—she wouldn’t let go of my thumb! Adrenaline, exhaustion, and excitement overtook my body at that moment; I couldn’t believe what I just did. I was shocked at how amazing it felt the moment I pushed her out. I heard her little lungs let out an extremely loud wail of a cry a few seconds after her birth, and then I felt her body snuggle up directly on my chest. Holding her close, I looked to my left and saw my husband cut her cord; I also overheard Laura say that she needed to go take a shower. It turns out that they never popped my water—Maddie was born “en caul,” which is a fancy way of saying that she was born in her sack of water! They let me do skin to skin with her for at least an hour, which was wonderful. Even more than that, once they got me all stitched up (honestly, that part was way worse than pushing), everyone left and it was just me, my husband, and the baby. Maddie latched on towards the end of that hour, and it surprisingly didn’t hurt. An hour or so later, nurses and the pediatrician on call came back in and took all her vitals (9lb, 1.1 oz; 20 1/4 inches long), and then I requested a bath for her. They usually wait and do a bath around 6 hours after birth, but little Maddie was a little on the gnarly side since she was born in her sack of poop—yeah, she pooped, so they cleaned her up sooner rather than later. All in all, while I didn’t think it at the moment (because, let’s face it: labor is crazy), I absolutely positively loved everything about my labor this time around, and dare I say it, but it was actually fun. The midwives I saw were absolutely fantastic and my husband was my rock throughout the entire ordeal. This birth was the complete opposite from my first labor and delivery, and it honestly makes me think about doing this at least one more time. Madilyn fits in with our family as though she’s been here all along, and I’m so thankful for her. Happy birthday, little Maddie Roo! Such an amazing birth story! You did awesome. She's beautiful! SO AWESOME!!!! And other than the water breaking (or not, haha) your labor sounds so much like mine with Millie!!! I questioned everything until I was in transition. I mentioned to my nurse once that I didn't want to lay down because I was afraid the contractions would stop. (they were consistent unless I was in bed.) She laughed at me! LOL! All I remember was telling her I felt a little pressure….a few minutes later some burning…and then my body was pushing on its own! Like you, they wanted me to wait for the doctor to arrive, so they told me not to push. Hahahahahaha. Like I could help it?! My nurse delivered her because she came so fast. The doctor arrived just in time to stitch me up. 😛 And yes, that was way worse than labor! I didn't know babies could even be born still in the sac! That's pretty neat. My first labor was induced and it was horrible. I don't wish that on anyone. My second was quick. I started having contractions at 10:30 in the morning, got to the hospital at 2:30 and she was born at 5:30. I wasn't sure about my second because I didn't have natural labor with the first. I felt like I should know, but I had no clue what I was doing. She is beautiful!! I am glad you had such a wonderful experience this time around. Congratulations! Oh man, how crazy that she was born in the sac! I love how happy you look in that picture holding her! Love love love your story!! It's making me so excited for my upcoming birth. Such a great story! Congratulations!!!! Loved the birth story! I'm hoping that with my second I have a similar experience as you did. I hated being induced the first time and would much rather going into labor naturally this next time. Also..I love that she was born in the caul! As someone who wants to be a birth photographer, I am obsessed with this, I think it's so neat to see when they are born that way. So cool! I'm so glad I didn't give up on my ridiculous number of unread posts in my "Daily Reads" category. 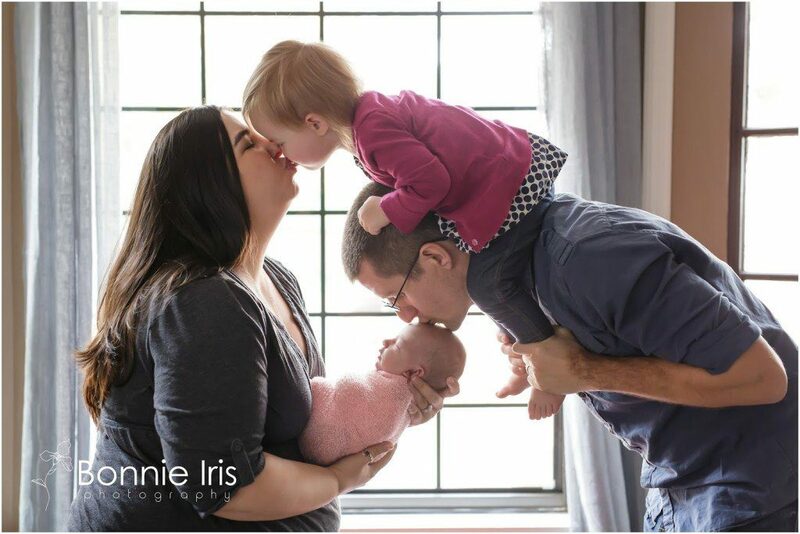 This is such a beautiful birth story! I'm so glad to hear this one went better for you. That family portrait is simply wonderful, by the way. Isn’t it funny how different labors can be?! I’ve posted two of mine on the blog this month, and I’ll be posting the other two also, and reliving them I’m struck again by how each one varoed from each other. so gald that everythiny went so well for you the second time!